What does this collection of stuff look like to you? If it looks like a bunch of dirty jars that need to be thrown out, then this article is probably not for you. 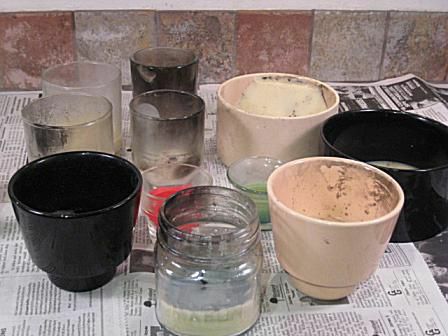 If it looks like a collection of dirty, but still wonderful candle containers, just waiting for a frugal, green-minded, candle-loving crafter, then we're ready to go. Spread newspaper out onto your counter or table, and be sure that you're wearing old, craft-clothes. I guarantee you, you will get melted wax on your clothes, and there will be drips of wax onto your work surface. Trust me on this one. Unless there is a lot of good, clean wax leftover in the candle, I don't recommend recycling this candle wax. It's generally got too much soot, burned wick tips, and other cruddy stuff to really make it reusable. Once the container is as clean as you can reasonably get it (don't spend TOO much time scooping - just get out most of it), place the container on top of 1-2 sheets of brown or parchment paper (to absorb the wax) on a cookie sheet, baking pan, or other shallow container. Make sure that pan or cookie sheet is solid enough to steadily hold the weight of the containers as you're putting it in and out of the oven. Place the pan(s) into an oven set at about 180-190 F.
Let the candles heat in the oven for about 10-15 minutes. Check on your containers. If it appears that most all of the wax has melted, go ahead and carefully take them out of the oven and put the pan onto a heat-safe surface. This is where you'll be either delighted or overwhelmed by the mixture of scents coming from the melted wax. With this batch of containers, there were over 10 different scents all mixing together in the kitchen - Whew! It was strong! Note: If you've got some metal votive molds that need to be cleaned, you can just add them to the same pan and heat them up! When you take them out of the oven, you'll see that all of the wax has melted and most of it has run down onto the brown paper. With one hand, hold the candle container/jar with a towel or hot pad. With the other hand, take 3-4 paper towels and wipe out all of the wax, soot, burned wick pieces etc. I'll generally use several paper towels for each jar. Be sure to wipe out both the inside and the outside...as well as the bottom of the candle container. While you're wiping, be sure to inspect the candle container thoroughly for any chips, cracks or other imperfections. Sometimes little hairline cracks will become apparent when the jar is hot and you're wiping the wax out of it. If you find a crack or imperfection, throw it out! Set the jars aside to cool. That's it! 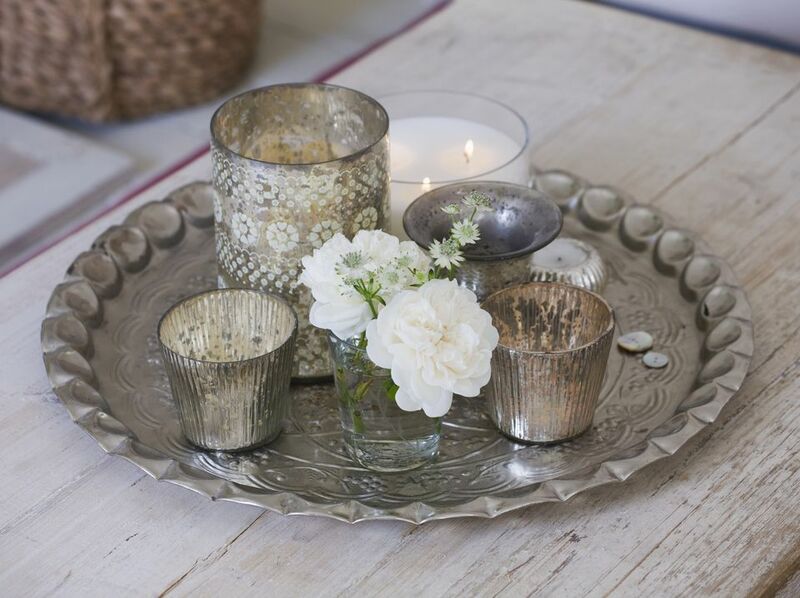 As with any candle container, before you use it, be sure to inspect it for any cracks, chips or other imperfections. If it doubt, throw it out. But if it's still in great shape - reuse it! You're ready for an entire new generation of wonderful container candles.